change some features of the most important event of the local unionist history, especially those that involved the revolutionary union as protagonist. A conflict has been going on almost a half year between FAU and the ecological farm Teltower Rübchen. The problems concern improper payment during training periods, not following health and safety laws, low wages and the use of immigrant labour without contracts. There were attempts to negotiate with the owner of the farm, a member of the Green Party (which includes postualtes about a decent minimum wage that is higher that what is paid at the „green” farm). He refused to meet with FAU, so the union started to make a pressure campaign, campaigning where the farm seels its products. As we know that at least some consumers who buy green products are also concerned about the working conditions they are produced in, we hope that people will show their discontent with the situation at Teltower Rübchen and that the situation will improve soon. From the ZSP, we add that we do not accept the exploitation of Polish, Romanian and Ukrainian immigrants who are in desperate situations and are forced to work without contracts. We demand proper treatment and full rights for workers who have been harvesting the fruits of Teltower's profits for years. The company made a commitment not to lower the salaries of the workers, at least for now. They will pay the Christmas bonus to workers, on a prorated basis until the Government pays the debts to the company. The management is committed to dealing with the issues of workers health and safety and will continue to meet regularly. We are pleased that the company and the workers have reached an agreement directly and without intermediaries. The union, with this good perspective, has stopped the strike and appreciates the outpouring of support received. Our comrades in the USI-AIT have been protesting, striking and struggling against the planned dismissal of 244 workers at San Raffaele Hospital and the cencellation of contract agreements which were won after many years of struggle. destroying the social state and among the system's objectives is destroying health care. 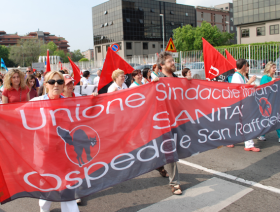 The comrades employed at the San Raffaele hospital, together with other unions, are on strike against the dismissal of 244 workers and against the cancellation of the contract agreements which were won after many years of struggle. Two days ago, the comrade Graziella (delegate of USI) and Daniela camped on the roof of the hospital to give greater visibility to the protests. 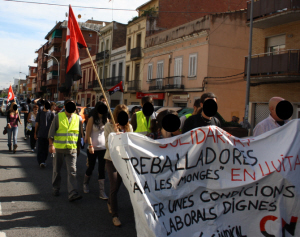 To sustain the common struggle, the workers of San Raffaele are engaged every day in strikes and demonstrations. The demonstrations in Milan on the 24 of October and the 14 of November were very significant and important. 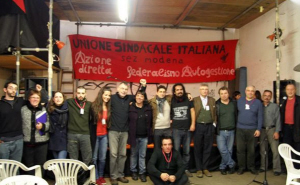 Comrades attended Modena from Brazil, France, Great Britain, Italy, Norway, Poland, Portugal, Serbia, Slovakia, and Spain and the Plenary was excellently organized by the USI-AIT. 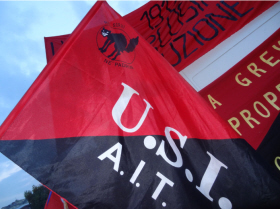 On Saturday evening the Centenary of the USI-AIT was celebrated by a demonstration, speeches and with events in the evening as Modena is the place in which the USI was founded hundred years ago. Both the Plenary and the Centenary was held in a very comradely spirit! 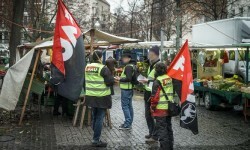 There has in the period since the last IWA Plenary in Warsaw in the end of October 2011 to the Modena Plenary, not only been austerity measures and cuts, but also an ideological campaign against the workers. This campaign tries to convince working people that the austerity and crisis is ‘their fault’ and not the reckless speculation and deregulation of the world economy. The “solution” of the states and capitalists is to dictate the workers to accept what they call “the logic of the market” and austerity measures and attacks are presented as “financial” necessities and “laws”. The websites of the Sections, the IWA website and IWA`s External Bulletin show that the IWA and its Sections and Friends day by day are increasing their mobilizations, presence, activities and direct actions: It has in these eleven months since the last Plenary been IWA Days of actions against Austerity measures, exploitation and oppression from March 29 to 31, a General Strike in Spain March 29 and in Spain and Portugal etc. 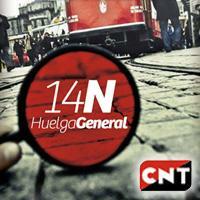 on November 14 that were support by the Sections, and a lot of Urgent actions in support of workers in conflict! From Nov. 23-25, in Modena, Italy, the birthplace of the USI-AIT, the IWA Plenary took place. 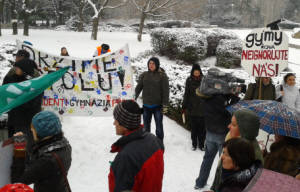 On Saturday there were also events related to the centenary of the founding of USI-AIT. Delegates attended from Europe and S. America to represent their sections at the Plenary and to join in the celebration of our sister union. The Plenary mostly dealt with organizational matters but also set various mobilizations for the upcoming year. So starting in the spring, we can expect various coordinated actions to take place around different issues. The work of the Plenary went quite smoothly, so there was no problem to break early on Saturday to go celebrate the centenary of USI. 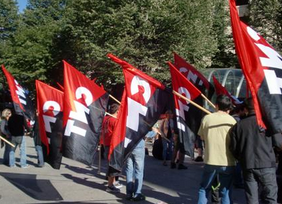 During the summer and at the beginning of autumn, the Russian regional section of the International Workers' Association took part in a number of protest and solidarity actions. On June 1, a group of activists from KRAS attended a rally against the commercialization of education, to show its full support of the struggle for free education and resistance against the attacks of the rich and powerful against our social rights. We do not take part in political actions and campaigns which revolve around on who will rule us, out of principle. But just as principally we take part in protests which have a purely social nature and we call on workers not to believe politicians and bosses: only the self-organized struggle of people for their rights can lead to victory. 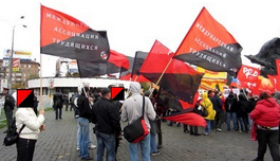 On the same day, members of KRAS took part in a rally in memory of the workers of Novocherkassk, whose strike was violently repressed by the ruling pseudosocialist regime in June of 1962.